One of WWE's top tag teams, the Usos have contracts that expire in April. Should they jump to AEW or not? Jimmy and Jay Uso come from a long standing tradition of Samoan wrestlers in the WWE. Their lineage is from the legendary Anoa'i wrestling family, which also includes major stars like The Rock, Nia Jax, and their father, Rikishi Fatu. The Usos follow in the footsteps of their fellow 'Island Boys' tag teams such as the Islanders, the Wild Samoans, and the Samoan Swat Team. The Usos have managed to capture tag team gold on six different occasions while signed with the WWE, and are without a shadow of a doubt one of the best pure tag teams working for the company today. Also, their mainstream media appeal is high due to Jimmy Uso's appearances on the Total Divas program airing on the E Network, where his wife Naomi/Trinity has been featured. Unlike many of their contemporaries, the Usos have only ever worked for the WWE, having come up through the developmental league of Florida Championship Wrestling. However, that may soon be changing. The Usos have their contracts coming up in April, and it has been rumoured that upstart promotion All Elite Wrestling is interested in acquiring their services. 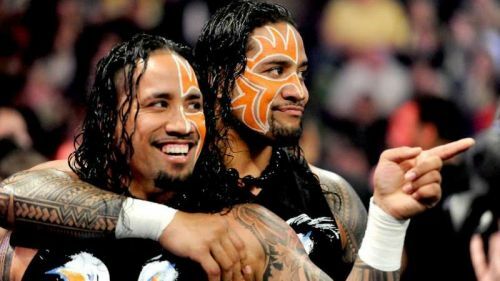 Here are three reasons the Usos should sign with AEW, and three reasons the team should remain with the WWE, their home for almost a decade. 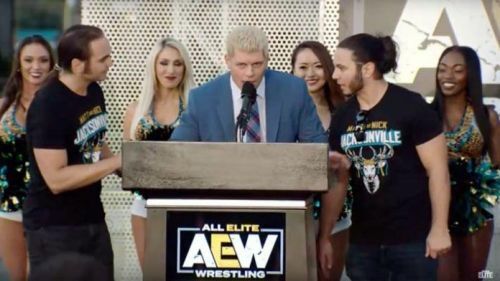 Should Not Join All Elite Wrestling #1: The AEW's future is uncertain. Cody Rhodes and the Young Bucks at a press conference. While the prospect of All Elite Wrestling giving serious competition to the WWE is an interesting one, as of this writing they do not have a television deal squared away, and the only contract signings they have announced are of a part time nature. No matter how many press conferences, talent signing announcements, and media hoopla the AEW generates, until they have a solid distribution plan and multiple shows booked they are primarily a T-shirt company. There have been many pro wrestling companies that have come and gone, and there's no guarantee that All Elite Wrestling will be successful enough to remain in business for the long term. Jimmy and Jay would do well to think about their future before they take the plunge and sign with AEW.